Squirrel and Bunny Patchwork Baby Crib Quilt in Fall Colors. 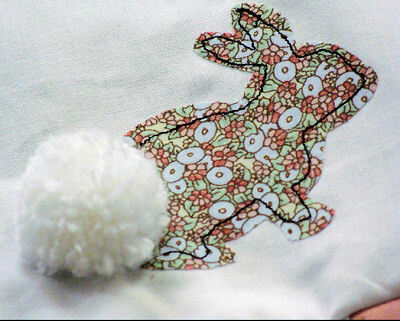 I love the calico bunny applique's fluffy Pom Pom tail! 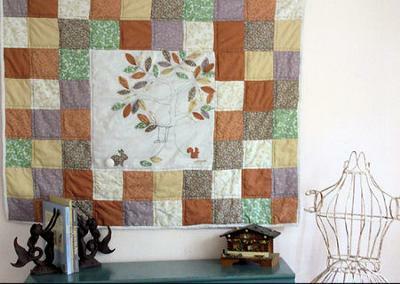 Our quilting friend Amanda designed and made the squirrel and bunny applique quilt in fall colors that you see in the picture. The beautiful appliquéd center medallion of the piece is surrounded with a border consisting of small, patchwork quilt blocks. Go here to see more quilting fabrics in fall colors that can be used for this sewing project. Amanda is known as itchinstitchin online but who might she be in real life? 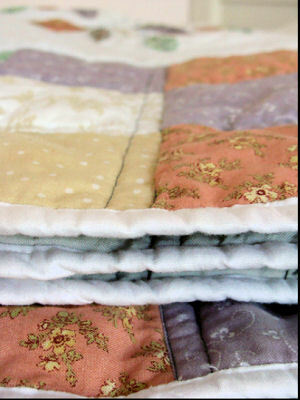 The seamstress who created this cute baby quilt is Amanda, a wife and mother with three children. How she balances her day job as a frustrated cubical call center agent, tends to her children, husband and farm and STILL has time to whip up such delightful items is a mystery to me but if you visit her blog you will see that she does a super job of it! To see more of this crafter's amazing work visit Itchinstitchin, to see some cute, free patterns and has had an embroidered quilt blocks giveaway on her blog so you will want to follow her on GFC and visit often to see her latest projects! I'm sure that Amanda's baby sewing projects will inspire many creative forest theme nursery ideas and that Unique Baby Gear Ideas' visitors will want to visit to her blog to see what she has in the quilting frame right now! I love the appliques on this quilt and the colors that were used in the design but it would be lovely to have access to a pattern for the bunny rabbit and the squirrels to go by. Join in and write your own page! It's easy to do. How? Simply click here to return to BABY QUILT PICTURES.